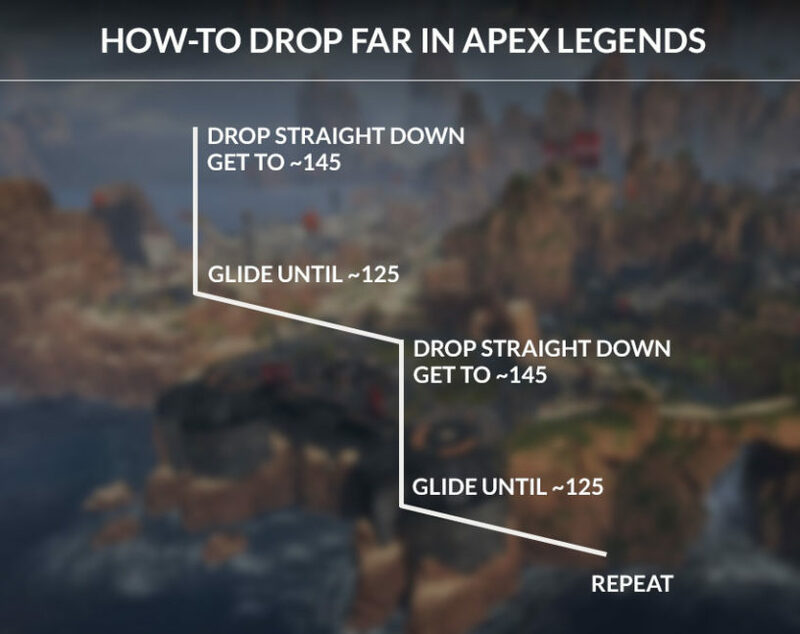 Home » Apex Legends » Apex Legends How-to Glide – Fly Further With Your Launches! We're looking at how-to properly glide and gain a lot of distance on your launches in Apex Legends! Our Apex Legends How-to Glide Guide will walk you through getting further on your glides. This isn't as obvious as it seems, and if you want to get far distances on the map in Apex then you'll have to know how to do it correctly! There's two different things that we're going to look at with gliding. First, we're going to look at the proper technique for stretching your glides out when you launch initially in the game. This is important for reaching those further landing spots you might want to hit with a bad launch path. Second, there's a technique for getting really far when taking a balloon relaunch. This is sometimes called the "super glide" technique, and it's good to know for getting he most out of those balloons. If you watch to stretch your launches when jumping at the beginning of the game you will have to use the step or wave method. To do this, you launch straight down (looking down with your reticle) until you reach ~145 and you then flatten out and glide (looking forward with your reticle). Once you hit ~125, you'll again drop down until you hit ~145 and repeat the process again until you reach your destination. If this is a bit confusing, then check out the image below. This method should be used in just about every situation, even when heading towards a fairly close location because it maintains a higher speed than you would if you were just gliding at an angle. It's also better to jump earlier and use this method rather than jump from above and launch straight down! If you are still a bit confused, check out this video. This technique might actually be a bug, so we don't know if it will be in the game for much longer. To accomplish this, find a balloon relaunch point and face the direction you want to travel. Start climbing up the rope and look directly up towards the balloon. Once you launch you'll get a prompt to press a freelook button, either Right Click (PC) or Left Trigger (Console). Hold down this button and forward, and as you start to fly you'll be going normally but when you come close to some terrain you will start the hover animation. Instead of dropping you down to land, it will actually bump you upwards so you can continue to fly forward. Once you are in this animation you can move a bit left and right by using the movement keys. Look for more terrain to continue to keep yourself up in the air! If that's a bit confusing to you, hopefully this video will help clear it up! This super glide technique gives you a much larger range from a relaunch if you can pull it off correctly.